In an interview last night on CNN's "Larry King Live," the former president of Mexico, Vicente Fox, confirmed the existence of a government plan to create the amero as a new regional currency to replace the U.S. dollar, the Canadian dollar and the Mexican Peso. But it is all lies. Vicente Fox actually said nothing whatsoever suggesting that President Bush ever expressed support for "merger," or for combining the dollar with any other currency, or for replacing it with an "amero." Not a word. Here's a letter that I wrote to WorldNetDaily President Joseph Farah on Oct. 11, 2007, detailing the lies in Corsi's article. I resent it several times, by both email and fax, but Mr. Farah never replied. Criticizing a Corsi article is like shooting at a moving target. When confronted with particularly obvious misstatements in one of his articles, Corsi does not admit them, as an honest man would. Instead, he tries to hide the fact that the flaws were ever there, by editing his article on the WorldNetDaily web site, without any indication that he has done so. KING: E-mail from Mrs. Gonzalez in Elizabeth, New Jersey. KING: It's going to be like the euro dollar, you mean? processes to go, first step into is trading agreement. KING: How is NAFTA doing? in this economy in the U.S.
As you can see, Fox did not say anything resembling what Corsi claims he said. Fox never suggested that Bush supports unifying the American dollar with any other currencies, or replacing it with a new currency. Vicente Fox... confirmed the existence of a government plan to create the amero as a new regional currency to replace the U.S. dollar, the Canadian dollar and the Mexican Peso. Surely Corsi knows that the USA is not part of Latin America! Nowhere in their conversation did either Fox or King say anything about a common North American currency. So why did Corsi change "Latin America" to the USA, Canada and Mexico? Because a common currency for Latin America would be inconsistent with the Bircher "Amero" / "North American Union" hoax, which is an imagined secret plan to merge Canada, Mexico and the USA. The two ideas are incompatible: Latin America is Mexico and points south. North America is Mexico and points north. Mexico is in both Latin America and North America, but the USA and Canada are not part of Latin America. As you can see, Fox replied that there's no common currency in prospect for Latin America for a long, long time to come. Note that he neatly avoided answering the question he was asked, which was what he thinks of the idea of a common currency for Latin America. Fox's English isn't very good, but he is an experienced politician, who knows how to dodge a question! Then he changed the subject, to talk about something less pie-in-the-sky: trade reform (one of his favorite topics). That could have been accomplished, he said, if Chavez hadn't thrown a monkey wrench in the works. Corsi managed to cram three lies into just one partial sentence! Fox made no "revelation" about a currency. Just the opposite, in fact: he dismissed the idea as not being possible for a long, long time to come, and changed the subject. King wasn't startled. Rather, he knew that Fox had changed the subject from currency to trade without answering his question, and interrupted Fox to try again to get him to talk about a possible common currency for Latin America. Corsi's use of the phrase "the currency" is his sly way of obscuring the fact that they were talking about a Latin American currency instead of a North American currency. As you can see, Fox again avoided saying what he thought of the idea of a common currency for Latin America, and just repeated his opinion that a common currency for Latin America couldn't happen for a long, long time. Then he again changed the subject to trade. What Latin America really needs, he said, is a trade agreement (which, as he'd just mentioned, Chavez is blocking). Then, he said, they need to work on finding a "new vision" in the region, which was an apparent reference to the need for much greater frendliness and cooperation between the Latin American countries than is possible with scoundrels like Hugo Chavez in power. 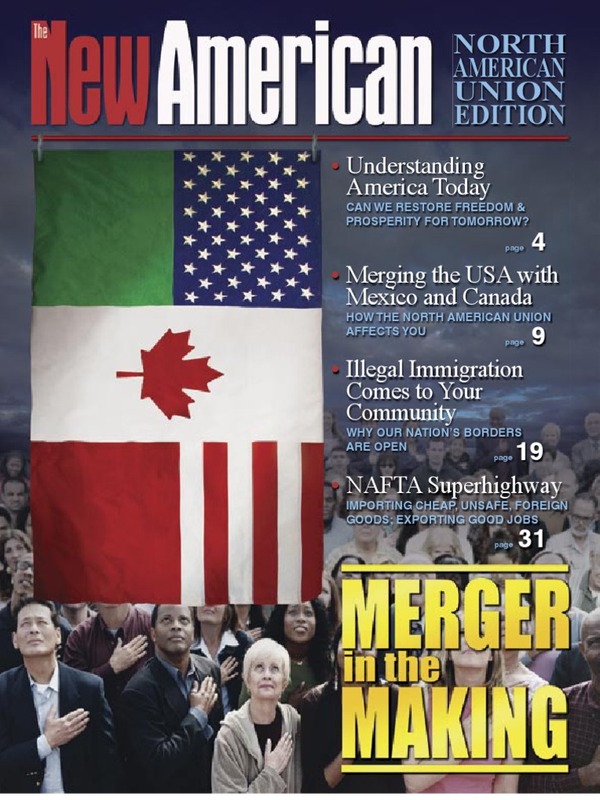 Fox explained that he and Bush intended to proceed incrementally, establishing FTAA as an economic agreement first and waiting to create an amero-type currency later - a plan Fox also suggested was in place for NAFTA itself. That's a complete fabrication. Fox said nothing at all about any plan to create an amero-type currency, and nothing at all about doing so for NAFTA, either. NAFTA, said Fox, is doing "excellent," increasing trade and creating jobs in both the USA and Mexico. He never suggested that there was any plan or need for a common currency. Corsi just made that up. "Fox... admitt[ed] he and President Bush had agreed... and that part of the plan was to institute a regional currency from Canada to the tip of South America." But Fox said nothing at all like that. Corsi just made it up. It is a total fabrication. Corsi wrote three headlines, with not one word of truth in any of them! Contrary to Corsi's headlines, Vicente Fox said nothing suggesting that President Bush entered into any secret "long-term deal," or that he ever expressed support for "merger," or for the mythical "amero," or for combining the dollar with any other currency. Corsi's headlines, like his article, are just a series of lies. Corsi is a dishonest journalist, who discredits the WorldNetDaily news service. Joseph Farah should fire him, and apologize to his readers.